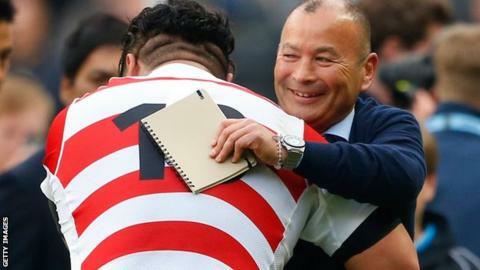 Head coach Eddie Jones says Japan have more to give at the World Cup as they aim to reach the quarter-finals for the first time. "We still haven't played as well as we can," said ex-Australia coach Jones. "We probably left two tries out there [against Samoa]. We've got the USA game next and we'll look forward to playing the best game of our World Cup." With South Africa likely to qualify as Pool B winners - they face bottom side United States on Wednesday in their final game - Japan are hoping to go through as runners-up. Australian Jones, who was appointed Japan head coach in 2012, said: "One of the things I wanted to do was put pride back into Japanese rugby. "I coached Japan for the first time in 1996 and came back [as a coach] in 2009 and was quite dismayed by the level of rugby in Japan and the national team. "I watched them play against New Zealand in the 2011 World Cup. The All Blacks treated it like a training game and won 90-0. "We've managed to create the right environment for the players and show Japan can produce a serious rugby team and serious rugby players." Jones says his side can change the perception of rugby in Japan, where sumo wrestling, baseball and football are the main sports, if they reach the knockout stages. "You look at the history of Japanese rugby - they've won one World Cup game in 24 years. We've just doubled that," said the 55-year-old. "If we can win against the USA, we've changed the history of rugby in Japan. "There were 20 million people in Japan who watched the game against Scotland. They opened the ground in Chichibunomiya for the fans to watch us play against Samoa. "Five years ago we would play a game and there would be 4,000 people there. Now they open the stadium and we're not even there. That's a pretty considerable change." Japan have been well supported at the World Cup, with Jones saying he had "never seen so many Englishmen wandering around with Japanese shirts"